I saw this on a other forum and thought it would be cool .So here it goes! Come everyone what do you look like behind the name?? 5 gallon,natural planted tank with 1 betta. 6 gallon guppy fry tank. Oh and here is me and that boyfriend I mention a lot ;3 rawr! two years and counting! excuse me while I fangirl over him for a moment.. LOL! It's hard being away at college! I get to see him on my birthday though! Last edited by purplemuffin; 09-30-2010 at 04:28 PM. Me and Romeo (My horse :P) You can't really see me to great...but I really like this pic! :P Srry it has some edited ness to it but I couldn't find the orginal! I miss you every single day. You were more than just a pet to me. I love you forever and always. I hope you always know that I would have done anything to save you. Hmmmm.... I studiously avoid being photograhed for several reasons, BUT.... if you take this photo of Tom Waits, add a full beard about 1 1/2" long instead of the soul patch then make it all salt and pepper, you'll be pretty darn close. Yup, rode hard and put up wet, lol. Well here's the most recent one I've got? OK, this is me. I'm not photogenic AT ALL. lol This was taken several years ago in Germany by the Rhine River. My hair was a total mess! 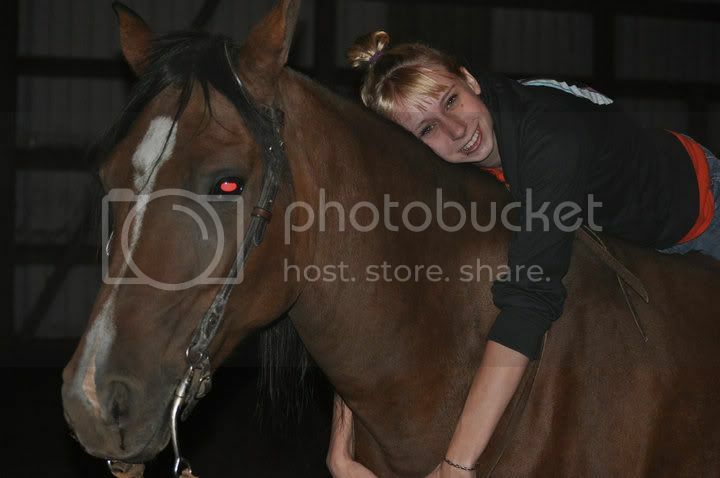 Me and my horse, I can't find any good ones of just me.